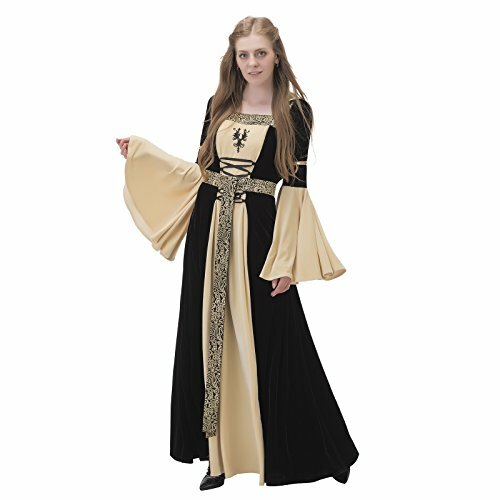 This dress made with stretch Ice velvet,it has a very classic medieval silhouette. It fits neatly to the waist then falling softly from the hip.The waist fitting can be adjusted by the ribbon lacing at front. It has a square neckline trimmed with golden pattern .we also made matching golden belt,if you want a belt please choose the"dress with belt". All dresses are handmade by our tailors,please allow 2-4 cm manual measurement deviation for the data. We also offer made-to-order, if you choose it,please email us your measurements(height/chest/waist) and allow 2 weeks for our tailors.We use DHL for shipment,it generally takes about one week except for special circumstances.Please don't hesitate to contact us for any question.